Perfect for vegetarians and vegans, this fluoride free toothpaste contains no artificial sweeteners, flavourings, colourings or preservatives and because it also contains no mint, it is also suitable for those taking homeopathic treatments. Flavoured with natural fennel, tea tree and aloe vera, regular brushing with this toothpaste will help clean your teeth and aid the removal of plaque, therefore, assisting you to keep your mouth and gums healthy and breath feeling fresh. Directions: Children under seven years old should use a pea-sized portion during supervised brushing. For better general oral health reduce the frequency of sugar consumption to a minimum, it is the major cause of dental decay. Not tested on animals and GMO free. Calcium carbonate, glycerine, aqua, sodium lauroyl sarcosinate, hydrated silica, cellulose gum, melaeuca alternifolia, citrus limonum, aloe barbadensis, foeniculum vulgare, limonene. 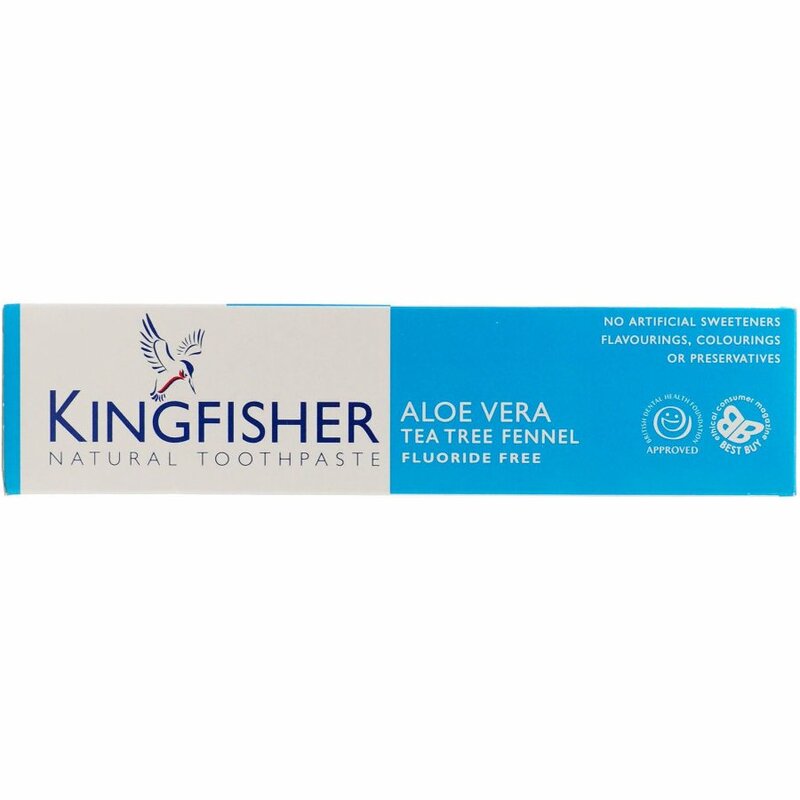 There are currently no questions to display about Kingfisher Toothpaste - Fluoride Free - Aloe Vera & Tea Tree Fennel - 100ml. Kingfisher was the first company to produce natural toothpaste that was approved by the British Dental Health Foundation. Kingfisher toothpastes are GM- and gluten-free and suitable for vegetarians and vegans. None of these natural toothpastes contain artificial colourings, flavourings, sweeteners or preservatives. Kingfisher, named PETA’s Best Cruelty-free Toiletries and Beauty Product, really can be relied upon to provide the most natural, effective dental care.